5 Ways to Beat That Headache! by Selena Fragrassi for Thrive Market It seems just about everything in our modern world could be considered a potential headache trigger—from the rampant use of fluorescent lighting and eye strain caused by our addiction to mobile devices to frequent and unpredictable weather changes. While over-the-counter (OTC) medicine is a good quick fix, taking it regularly can potentially cause some serious problems in susceptible people, especially if mixing it with other OTC remedies. So if you find headaches are becoming more of a daily occurrence, there’s no need to endure the pain, or make yourself sick in the process. Check out these helpful, all-natural products to keep your head straight. When a migraine hits, the thought of doing anything but retreating to bed with the lights off seems impossible. But, with this therapeutic headache pillow, just a quick catnap can get you back on your feet. Made of 100 percent organic, fair trade cotton, the unique design also features clay nature beads infused with lavender essential oil that will calm the nerves and alleviate aches. Put the pillow in the microwave for a few seconds to create a hot compress that can be extra soothing. 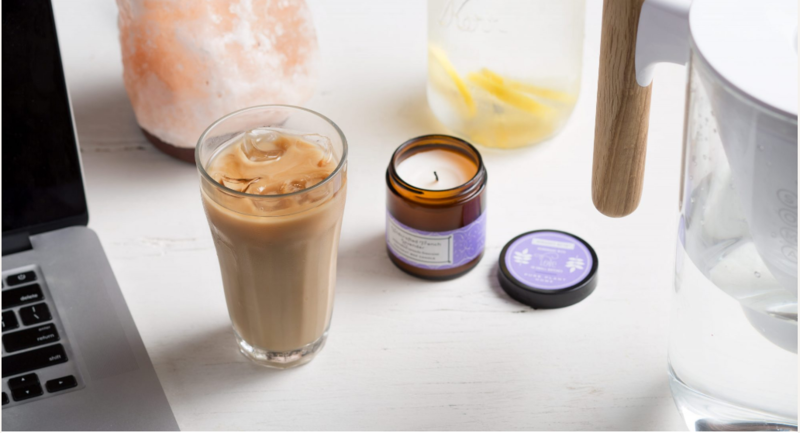 Rejuvenating lavender is also the key ingredient in this fresh-scented candle. Filling the room with the aroma will provide instant relief, and with a burn time of 24 hours, it’s ideal for the marathon migraines and all the little aftershocks that come with them. Pure Plant Home’s product is completely vegan, made with sustainable coconut wax and essential oils, and hand-poured into a decorative amber glass jar. The next time a migraine starts to creep up, instead of running to the drugstore, head to the nearest café—or make a fresh batch at home with this easy DIY kit. Caffeine is a wonder drug when it comes to headaches because it constricts the blood vessels, mitigating the pain. It’s so effective that it’s often included in OTC pills like Excedrin. For the best results, drink a cup of strong black coffee, which you can get with every batch of Coffeesock ColdBrew. This convenient DIY kit lets you make up to 64 ounces in advance that keeps for a couple of days, allowing you to have some on hand when you need it most. On the flipside, headaches can also be caused by dehydration. The brain rests inside a fluid sack, which prevents it from hitting the skull; but if the fluid gets too low, there can be more friction, which causes the pain. It’s easy to drink up with this elegantly-designed pitcher that holds up to 10 cups of filtered water and has a convenient lid that automatically opens when refilling. You might also consider a reusable water bottle that you can fill up and take on the go to ensure that you’re always hydrated. NATURAL CRYSTAL SALT LAMP BY EVOLUTION SALT CO.